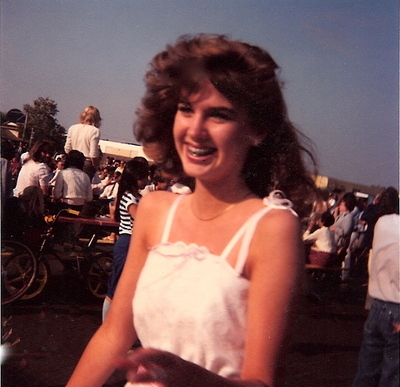 These were the "Best of Times"
There I am, graduation from 8th grade from the now-defunct Park View Elementary in Huntington Beach, 1982. I love this picture, braces and all. It brings back that afternoon in June so many years ago with crystal-clear glee. It was one of the happiest days of my life. Don't you remember that feeling of being young and completely unfettered and joyful? School was over and I had the new world of High School waiting for me after a summer of going to the beach and hanging out with my friends. I wasn't hammered by the worries of adulthood, or even the jittery angst of a teenager. I would give anything to have that feeling just for an hour today, but I think it's reserved for kids of a certain age, as it should be. Every cliche about youth seems to reveal itself as true as the years pass. The innocence and simplicity of that time is best personified in the inscriptions and signatures in my old Junior High yearbooks. It's funny, I found I was drawn more to the signatures than to who was voted "Class Flirt" or who won the baffling "Citizenship Award." In my yearbook inscriptions, the girls professed their undying friendship and the boys proclaimed, with astonishing clarity, their true feelings. I remember the honor and slight terror when handed a yearbook to sign; its owner hovering above me with a look that said, "This better be good. I wrote an entire three paragraphs on the back page of yours and claimed you as a FF (Friend Forever)." While reading my yearbooks, one thing that popped out at me was the request for me to "Stay Sweet." This was written over and over again: "Suzanne, stay sweet." So, either my friends thought there was a clear danger of crossing over to the dark side or it was just a filler comment like "Have a bitchin' summer. See ya at the beach," which also habitually appears in every Orange County yearbook. Some of the comments were touching and sweet. Reading them now, I wish I would have known more about what was going on behind the Vuarnet sunglasses of my Van-tennis-shoe-wearing contemperaries. In some of them, little stories peek through and remind me how important even the most fleeting relationship can be when you are young. Yep, Chip said I was "the prettiest girl in 7th grade" but, I found out later in my first lesson in the brutal reality that was adolescent boys, he signed that same thing in two other girl's books. "You have been the best friend a guy could have. When I first came here you were the first one to make friends with me. I always want us to be friends. You are the BEST! and I mean it." Danny. When our class graduated, we choose the song by Styx, "The Best of Times," to accompany us down the aisle. We were the first year to break from the standard, "We've Only Just Begun," by the Carpenters. I remember when they called my name, my older brothers and all of their friends cheered wildly from the back row. I can still see them jumping, whistling and waving their arms unabashedly in the late afternoon sun. I acted as if I were embarrassed by their show, but deep inside I embraced the great honor of even being acknowledged by high school boys. "Our memories of yesterday will last a lifetime...these are the best of times." "Were you a kid in Orange County in the 70's?" In the Orange County Register I wrote this list of all the things you might remember if you were a kid, growing up in Orange County in the 70's. Even if you didn't grow up here, some of the things you might remember. Make sure to take the time to look at the 50 or so reader's comments. There are some great memories in there, too. 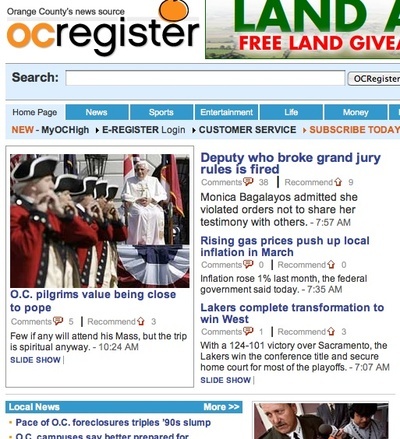 Here is the clip of my appearance on Daybreak OC, Orange County's very own morning news program. It's on KDOC from 6 am to 8 am, Monday through Friday. I watch it every morning, which is part of the reason why I was so nervous. Shally Zomorodi made me feel so comfortable and relaxed. If I look at ease in the clip, it's largely because of her. This video still for the clip is very strange. I couldn't figure out how to change it. If anyone know how to insert a new still into YouTube (beyond the three offered), please let me know. Another vlog I've put together chronicling my family's trip to Legoland in San Diego. My first television experience is now behind me, but I am still talking about it (and you thought I was impossible after McSweeney's). I wrote about it in my column: My Television Debut. This vlog includes the whole saga--from nausea to the best message ever from my mom. My dog Hazel gets excited when she knows she is going somewhere fun--me too. When I order, I act like I have never stepped foot in a Starbucks in my life and need an enormous amount of help ordering. At the counter I stammer, "Hmmm, what's popular here?" The stunned barista usually says something like, "Hot or cold?" To which I reply, "Oh, I don't want anything to eat, just a coffee." Stumped, cashier most likely will say, "No, do you want a hot drink or cold drink?" Then I spring a look like it's the first time I've ever heard of an iced cold java, "Oooo cold coffee? I'll have one of those." You see where this is going ... We go through the various choices – blended, on ice, caramel, vanilla, mocha, whipped cream – and with each suggestion I get more and more excited at the idea of it. "Great! I'll have a small iced mocha coffee," I finally say. This is where it gets really fun. An employee at Starbucks must be mandated to never utter the words "small," "medium" or "large," so they always repeat it like this, "That will be a tall iced mocha." "Yes, a small iced mocha coffee," I 'repeat' back. "Okay, a tall iced mocha," they 'repeat' back. My best friend and I just did this at a drive-thru Starbucks yesterday--they really WON'T say anything but the Starbucks sizes. I always tip big for being such a jerk and I never do it if there is a big line--I'm not THAT mean. I NEVER do this at The Bean, ever! Today in The Orange County Register I wrote "You know you were a teenager in Orange County in the 80's if..."
But, even if you aren't from Orange County, you might still like this trip through a time when synthesizers ruled the school and your room was plastered with Duran Duran posters. 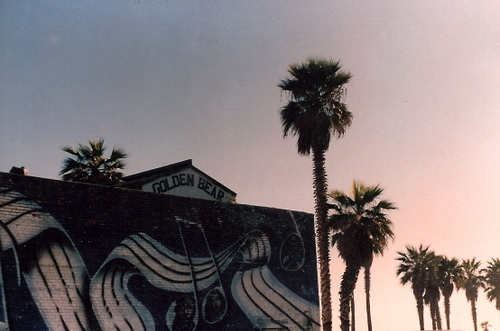 Back story: For reasons only known to him, Keith Sharon, my editor, didn't post this picture of the Golden Bear I took THE day it was torn down--that very day. You can just feel old HB in the photo...I'm pretty sure this was taken with a 110 camera--now that I think of it, probably why Keith didn't post, never mind. 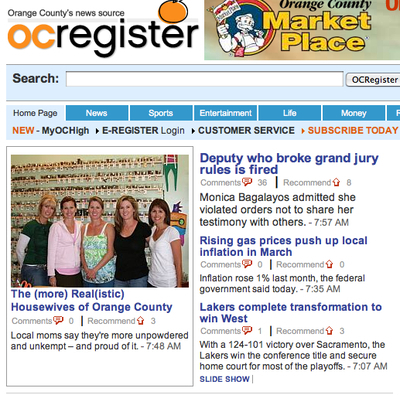 The Orange County Register picked up my post below "The (More) Real(istic) Housewives of Orange County" and plopped it right on the front page. But then put back up. Wow, Does God exist? Not sure what some of the comments even mean? Some had to be explained to me by aforementioned Editor. But I think it has shown that there is room for talk about "we" housewives. It hit a nerve with people. Some got the humor, some didn't. And as I've said before, the negative stuff rolls off my back, as long as I have the support of my family, friends and people who read me (and like me of course). Designer dog: $2,500, check ... "Juicy" dog sweater: $45, check ... Leather collar with matching leash from Muttropolis: $130, check ... Dog tag to identify your dog in case she gets lost: $5, but wait...ummm, can't find it. I was shopping with my family at The Spectrum one night and we eyed this adorable teacup Yorkie sniffing a potted palm. She was dragging her designer leash as she walked stiff and slow due to the thick pink hoodie"Juicy"sweater she was wearing. She was all by her lonesome. "Where is her mommy?" asked my dog-crazed daughter. Everyone passing by the fancy dog looked at her, then we all looked at one another. I went right over and picked up the two-pound pooch and fumbled around for her tag. Yes, of course, I wanted to find her "mommy," but more importantly, I secretly couldn't WAIT to find out what her name was: Frenchy? Muffin buns? Couture? Feeling around her neck...no...that's a necklace. No...that's her rhinestone charm. Incredible, she wasn't wearing an ID tag. The whole package – dog and accessories – hovering around the three grand mark and she didn't have on a five-buck tag? Now I was getting peeved. This is exactly what's wrong with the whole Paris Hilton & Tinkerbelldog thing. Dogs are looked at as accessories, not wet-nosed, bacon stealers that come with a load of responsibility. Adding to the potential of further feckless behavior, would-be owners can finance their pup purchase, really! Wells Fargo offers financing according to the sign in the window of Russo's. Wonder if they have a fore(paws)closures problem? "Repo-Pet?" Totally pitching that as a reality show. I felt like putting poor Frenchy (that's the name I chose) in my pocket and taking her home with me. True, I have an upgraded "King Charles Spaniel" and she has been known to get dolled-up in a spring dress, but she has her tag, her shots, her daily vitamin and... um, okay, her own stroller. It's not the pampering that is in question here, it's the capricious, slave-to-fashion attitude some take when purchasing a trendy dog. Looking around for her "mommy," I spotted a gal casually peering out from the doorway of a nearby store. Surely this couldn't be her dog. She looked as concerned as someone who misplaced their used tissue. "Is she yours?" I asked. "Oh, yes. I didn't see her slip away," said the not-even-attempting-to-act-concerned owner. She had price tags sticking out of her shirt and pants. Obviously clever Frenchy saw her chance at freedom while her mom was slipping on a pair of jeans and ran as fast as her four-inch legs would take her. "You might want to get her an ID tag..." I said, oh-so indignantly as I reluctantly handed her over. No "thank you" either, now that I think about it. She simply scooped Frenchy up and walked back to her dressing room to continue her business, most likely stuffing the dog into her handbag. I usually like to go to these charity events. I like getting dressed up, eating a nice dinner, meeting new people, all in the name of helping, in this case, "the kids." This night was different. As soon as we arrived and were seated I knew it was going to be challenging evening for me. The room seemed serious and sober. The lighting, far too dim to critique what the other women were wearing. The mood, far too solemn to have a good laugh. As Larry goes off to get me a glass of wine, I eye the fellow do-gooders at my table to find the one that has "I don't take myself too seriously," written on her face. Hummm, not seeing anyone here ... starting to panic a little ... "Where is Larry with my drink?" At these functions I sometimes feel only half grown up. Part of me says, "Yes, it is totally appropriate that I am here." The other half has the urge to help clear the table and follow the wait staff through the kitchen door, out to the back alley where we would sit on empty vegetable crates, have a cigarette and bitterly complain about next week's schedule. When Larry returns, I lean over and ask him if he ever feels that way sometimes. "No," he assures me, "I pretty much feel like a grown up." Drats, it’s just me. As I take a drink of wine, I peer over the rim and look, once more, at the woman seated next to me. I usually can find something to talk to anyone about, but she was a tough nut to crack. Our brief discussion of her medical condition and then her drive to the event left me searching for the kitchen door. This could fill up hours ..."What are their names?" 15 minutes – gone by. "Do they all get along?" 20 minutes – pass in a flash. "Don't you think most people don't understand cats?" Impassioned 10 minutes – spent. Before I know it, they are serving the main course. And luckily for me, her kind and caring nature was topped only by her ability to know when to stop talking, turn away, and eat her prime rib. We chatted now and then, and I really ended up liking her very much. Reluctantly, I went to my very first Mighty Ducks hockey game a couple of weeks ago. More specifically, it was my first hockey game ever. Our friends, Tim and Cathy, are season ticket holders and kindly invited Larry, my husband, and me. Oh my! The pushing and shoving, the unsportsmanlike behavior, the spite exhibited to one Paul Kariya, the loud music, the teetering, future lawsuit-producing blimp from “Togo's”...all of it has bewitched me, body and soul. (Surely the first ever reference in a hockey story. Click here to fully appreciate irony. My penchant for man-food, tolerance for stadium rock and love of organized chaos came together at The Honda Center that Friday night when the Might Ducks played the Saint Louis Whoevers. I was instantly smitten with the game and equally enamored with the fans. Poor, patient Tim had the misfortune of sitting next to me as I badgered him with question after question: "Where is the goalie?" "Can they touch the ball with their hands?" "What color are our guy's outfit?" "Are they allowed to be so mean?" "Is there really a Ruby's here?" "Don't they shake hands with the losers at the end of the game?" To which the answer was, "only in the playoffs." Awesome! In a world where political correctness has a free pass into our daily lives, it was refreshing to be where the woman sitting behind me with her kids could scream "rip his face off!" throughout the entire game, without the looming threat of someone calling CPS on her. 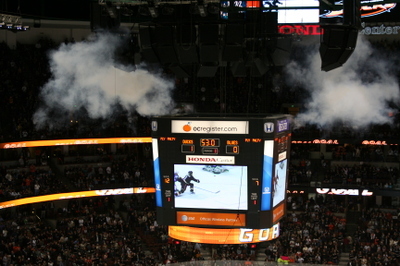 I also loved that every time the Ducks scored, they would shine a spotlight on the disgraced goalie, deepening his shame. And score they did, five times. Which Tim told me on the way to the car was a lot for hockey--we were lucky. He then apologized there wasn't more fighting--you can't have everything, I suppose. Better luck next time. Sometimes, living here, things seem so polished, perfect and pristine--like Trumanville. Hockey feels like the antithesis of refined--it felt primal. The Mighty Ducks: keepin' it real in Orange County. That should be their slogan. I've also hounded Larry nonstop to get us season tickets. I am pretty sure that's why he didn't take any of my calls today. My change of heart toward hockey reminds me of when in a movie a character says something like, "There is absolutely no way I am going to France," and then they cut to him sitting in a cafe, wearing a beret, drinking a cappuccino, violin playing in the background, talking to Gérard Depardieu (link name to http://ensnaring.com/gerarddepardieu/. )That's me, first it was "Hockey? Really?" then cut to me at my next hockey game, waving a big foam finger, eating a piece of First Class Pizza and screaming, "Rip his face off!"